The SERIES TTW Immersion Temperature Transmitter combines three popular products into a single package. 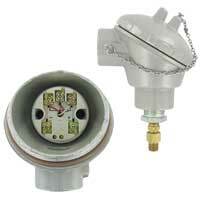 Our TBU series head mounted temperature transmitter is factory mounted into our A-709 enclosure. A Pt100 RTD version of our TE series is wired to the transmitter, giving insertion lengths up to 18". Each transmitter is factory programmed and calibrated to output a 4 to 20 mA signal proportional to the 32 to 212°F (0 to 100°C) temperature range. Pt100 RTD (TE Series Curve D). -328 to 986°F (-200 to 530°C). Two-wire 4 to 20 mA. 600 Ω @ 24 VDC. -40 to 185°F (-40 to 85°C).